Designed by fleet managers, our software brings efficiency across unlimited locations, departments, and business units. Save time and lower costs with a single data point that enables communication, eliminates redundant data entry, and enhances reporting by automating maintenance schedules, service requests, work orders, and more. With our fleet management software, each workflow has been carefully scoped and simplified for specific users and skill levels. We understand the roles of foremen, mechanics, operators, and admin staff members and their specific responsibilities in the asset lifecycle. Fleets require a large investment: be sure to receive the most value and return. Our fleet management software identifies costly units, make vehicle retirement decisions, and avoid breakdowns by automatically scheduling appropriate maintenance. With our fleet management software you can track and assign all purchased parts and services to work orders or pieces of equipment. 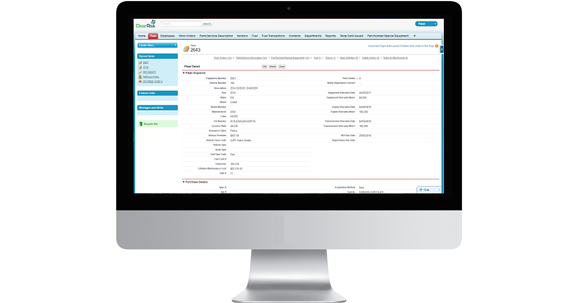 All data including expiry dates, invoice numbers, cost, warranties, and vendor information is stored in one central location. Attach tasks, activities, and notes to individual pieces of equipment for quick detail retrieval. Track warranty dates and launch work orders from within individual parts or service listings. Automated email notifications ensure expiry dates aren’t missed. Assign specific vendors to parts or service orders. Draw in history, contact, contract, and cost information automatically to negotiate lower prices while holding vendors accountable. Create activities and tasks and set important reminders. With our fleet management software you can attach supporting documentation and notes to any record, allowing for full transition to a paperless environment. Upload files directly or electronically via email into the document database, which is then searchable by title, subject, or content for quick retrieval. Export and share documentation with outside parties in one click. Immediately capture data from any smart device with our online data intake tool. This collection method is proven to increase data integrity and capture all necessary information. Mandatory fields and remote access eliminate in-house data entry and make data available for instant analytical reporting, uncovering previously unknown high-risk areas. Combine data from all modules to efficiently identify areas that require further attention with customizable graphs and charts. When reporting on claims, incidents, trends, assets, or policies, you can quickly receive a snapshot of initiatives and measure their effectiveness.